Subject to tremendous forces, the equine leg is subject to sprains and strains during athletic activities. © Hermann Dittrich. Handbuch der Anatomie der Tiere für Künstler. Leipzig: Dieterichsche Verlagsbuchhandlung. University of Wisconsin Libraries. 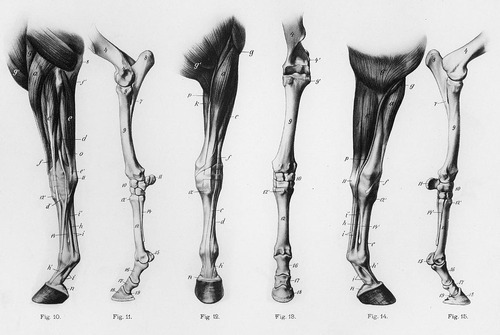 The bones in a horse's legs are supported by a system of muscles, ligaments, tendons and connective tissues that function to support the horse as it stands, diminish compression when the horse moves, and to protect the horse from injuries that occur from overextension of the major joints. A sprain occurs when a sudden or severe twisting of a joint results in tearing or stretching of ligaments. A strain is usually less severe than a sprain and is the result of overstretching of ligaments or tendons through excessive use or improper movement. Sprains and strains are common injuries in the lower limbs of competition and performance horses and usually result from over loading or over stretching, but can also be due to a direct blow. The most common damages are to the tendons and ligaments that run from the knee down to the foot including the superficial digital flexor tendon, the deep digital flexor tendon and the accessory and suspensory ligaments. Muscle strains caused by overuse or overstretching of muscle fibers in the croup and back of the thighs are another source of lameness. These usually occur during athletic competitions and the strain often includes ligaments and tendons. Sore backs and loin injuries usually occur when horses are racing or jumping and somehow twist their bodies causing strain to the muscle groups. The involved muscles become firm, warm and painful, and the horse will have a shortened stride and gait alterations suggestive of hind-quarter lameness. Back injuries from falling or going over backward sometimes cause the spines in the back to impinge on each other or overlap. This often happens in the saddle area and may also affect horses without a history of back injury. The problem is most prevalent in hunters and jumpers, and horses with a swayed back are most commonly affected. Hind-quarter lameness and great sensitivity to pressure creating pain in the back are signs of overlapping or damaged spinous processes. 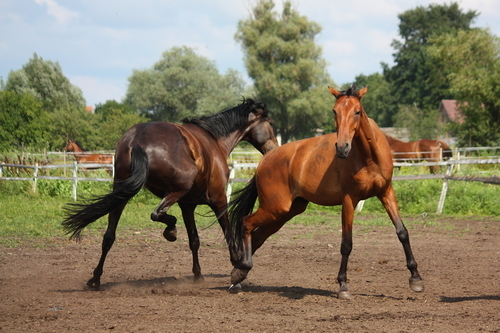 The force of a kick can easily fracture the bones of horses at play. Fractures are another form of injury that are usually immediately recognizable, although in cases of some hairline and stress fractures especially those to the cannon bone and chip fractures involving the joints below the elbow and stifle or in the bones of the foot are not immediately obvious on visual inspection. Fractures are caused by accidents such as falls, being kicked by another horse, stepping into a hole. Horses are also subject to compression fractures or fractures caused by high torque forces on a limb. Bone fractures are usually classified as open or closed. An open fracture breaks through the skin and is readily observable. A closed fracture such as a simple fracture or a chip fracture is usually contained within the limb and becomes observable only when lameness, pain, swelling, or fever occurs. A hard fall or running into a solid object sometimes results in a fracture of shoulder or the spine. These types of fractures do not occur often because of the force necessary to fracture these larger, better protected bones. At one time, a diagnosis of a fracture meant either retirement or a death sentence for the horse. However, orthopedic techniques have advanced greatly and many fractures no longer carry a grim prognosis. Injuries to any part of the musculoskeletal system can result in lameness with tendon injuries being rather common in horses. Lacerated or ruptured tendons can occur in the legs and the feet usually from a deep cut, a fall, a kick from another horse, or damage caused by striking a stationary object. Tenosynovitis takes several forms depending on the location of the trauma and is distinguished by a sudden building of fluid within the sheath of the tendon accompanied by pain, heat and lameness. Septic tenosynovitis is the result of bacterial infection resulting in pus and inflammatory enzymes that can digest the tendon. Pain and lameness are severe. Stringhalt involves the tendon of the lateral digital extensor muscle at the hock. It is characterized by a sudden upward jerking of the hind leg accompanied by an involuntary flexion of the hock as the horse steps forward. Some cases follow trauma involving the tendon, but in other cases, the cause is unknown. A young horse with good bone structure. Consider the bone and joint size of a young working horse prospect. Bursitis is the result of trauma to a bursa which is a closed sac lined by a membrane that secretes a lubricating fluid. These sacs are located between moving parts of the limb and act as cushions to prevent friction. An acute bursitis causes lameness. Septic bursitis occurs when a bursa becomes infected with bacteria or sometimes fungi. Immediate treatment is necessary to prevent further complications. Bursitis affects shoulder joints, hips, the cunean tendon at the inside of the hock joint, the elbow, the knee and any other point of movement cushioned by a bursa, and is often evidenced by noticeable swelling in the area, as well as lameness. Degenerative joint diseases affect both young and older horses. Stiffness and diminished range of motion are the hallmarks of lameness associated with arthritis. Acute serous arthritis is characterized by a swollen, tender, fluid-filled joint and is the result of either joint stress or injury. Also known as acute synovitis, this kind of arthritis does not necessarily progress to degenerative joint disease. Infectious or septic arthritis occurs when bacteria from the blood stream invade the joints destroying cartilage and causing irreversible damage. Bone spavin is the name given to arthritis of the hock joint. It is an occupational hazard in horses that are ridden at a hard gallop such as jumpers, race horses, and hunters. Typically bone spavin disappears as a horse warms up and reappears when the horse cools down and is known as a " cold" lameness. 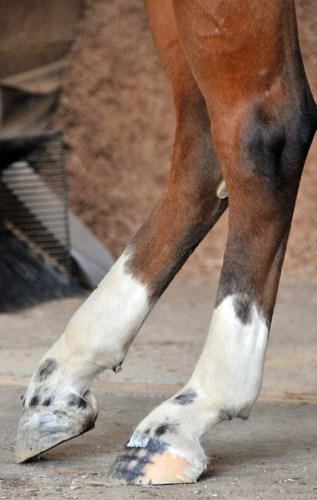 Osselets is an arthritis of the fetlock joint and may affect one or both front feet. In the initial stages stretching or tearing of the fetlock joint capsule is accompanied by signs of acute serous arthritis. As the arthritis advances, pain and swelling occur along with new bone growth causing the horse to take short, choppy strides and plant weight on the outside edge of the hoof. Shoulder joint arthritis is another common form of arthritis. It often occurs after a fracture caused by being kicked by another horse, running into a stationary object, or by a hard fall. Osteochondrosis of the shoulder joint in growing horses may cause sufficient joint injury to lead to a degenerative arthritis. According to research most causes of lameness are found in the foot of the horse. Domesticated horses living in paddocks and stables with limited opportunity to toughen their feet are susceptible to a number of foot problems. Foot wounds that are contaminated and allow foreign bodies, bacteria, yeast, fungus, dirt, and debris to gain entrance to sensitive parts of the foot lead to abscesses and infections that cause lameness, especially if they are not noticed and treated promptly. Navicular disease is noted as one of the leading causes of front leg lameness in horses. Foot stresses from hard stops, twists at high speeds, and abrupt changes in direction are thought to damage the navicular bone located at the heel of the foot beneath the frog. Years of poor foot care can lead to chronic leg pain and lameness. A competent farrier can improve, over time, the lameness due to lack of hoof care. 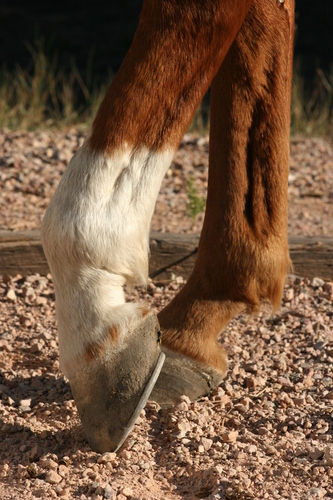 Poor foot conformation, infrequent or inadequate hoof trimming resulting in a long toe and low heel, sheared heels, contracted heels and improper horse shoeing are thought to adversely affect the transfer of weight through the navicular complex to the ground leading to injury to the inner structures of the foot. 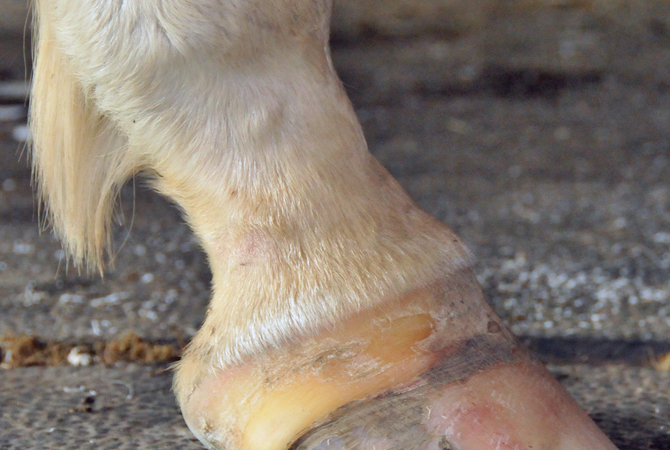 Initially, lameness is mild with navicular disease and comes and goes. As lameness worsens, a stiff, shuffling gait with a shortened, choppy stride becomes characteristic making it difficult for the horse to function. Many horses that live in stalls, and exercise in a groomed arena may develop thin soles that are susceptible to bruising. Rocks and other hard objects can bruise the sole or lead to corns that will cause the horse to limp with lameness getting progressively worse if not treated promptly. In addition, if a sole bruise resulting in an abscess is allowed to become chronic, it can lead to pedal osteitis which is a thinning and demineralization of the coffin bone. Foot injuries can also result in keratomas which are tumors arising in the horn-producing cells of the hoof wall, usually in the toe region and sometimes in the sole. When the keratoma becomes large enough to cause lameness, it is usually surgically removed. Thrush is a painful bacterial infection in the frog. Characterized by a putrid black discharge along with poor growth and degeneration of the horn, it is caused by lack of proper foot care resulting in a buildup of mud, manure and debris that prevents air getting to the frog. Canker is a chronic infection of the horn tissues of the foot that begins at the frog and progresses into the sole and sometimes the hoof wall. It is caused by a lack of foot care, and is usually the result of the horse standing in mud or bedding that is soaked in urine and feces. The appearance is similar to thrush, but it involves the sole as well as the frog. Improper or neglected hoof trimming often contributes to lameness when a horse has or develops contracted heels or sheared heels. 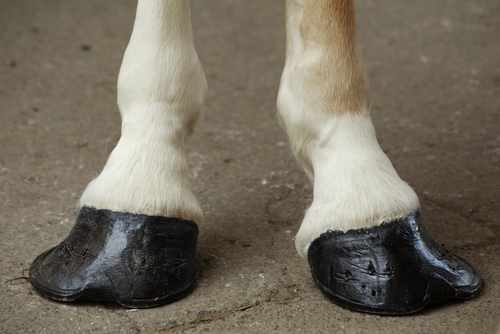 Usually corrective trimming and shoeing will prevent further lameness. Quittor is another foot disease caused by a deep-seated infection of the cartilages of the coffin bone. Infected material is discharged via a sinus tract that opens at or above the coronet. Injuries such as being struck by another foot near the lateral cartilages and penetrating injuries of the sole lead to quittor. An important job of the farrier is to assure that the hoof is trimmed in balance. An unbalanced hoof puts stresses on the hoof that may lead to cracks. Whiteline disease also known as seedy toe is caused when bacteria, yeast or fungus invades the foot and works its way up to the white line to the coronary band. Loss of horn creates a hollow space between the hoof wall and the sole that eventually is filled with cheesy material and debris. This disease seldom occurs in barefoot horses on pasture, but occurs with horses that are kept in wet stalls or exposed to frequent wet-to-dry episodes such as walking in wet grass or being washed down on a frequent basis. Hoof wall cracks are another cause of lameness, although some hoof cracks do not cause the horse to go lame depending on the location and depth of the crack. Once a crack is noticed, care should be taken to prevent the crack from lengthening and deepening. Deep cracks are susceptible to infection and since new horn has to grow out from the coronary band to repair the crack, steps need to be taken to clean, stabilize, and either do corrective shoeing or repair the crack using prosthetic material. Laminitis, also known as founder, is a diet-related disease that commonly occurs when the horse consumes excess quantities of carbohydrates that alter the bacterial balance in the cecum, indirectly leading to the release of lactic acid and endotoxins. The lactic acid and endotoxins cause the large digital arteries to the feet to dilate, increasing the blood flow while causing intense constriction of the small capillaries that nourish the laminae in the horse's foot. Deprived of oxygen, the laminae swell, the swelling damages the sensitive tissue in the foot, and unless the situation is relieved the inner structure of the feet may die causing a characteristic stance in which the two front feet are placed out front to take weight off the horse's toes. The horse develops a high fever and chills with sweating, diarrhea, a fast pulse and rapid heavy breathing. The feet become hot and painful, and if all four feet are involved the horse may draw its feet up under its belly and lie down. Although death from founder is uncommon, it can occur. In cases of severe founder, the hoof may slough off. Excess consumption of either too much grain or over-eating of lush, fast-growing summer pasture grasses causes most cases of founder. It can also occur during the winter if the horse consumes too much legume hay. Another cause of laminitis is the drinking of large amounts of cold water by an over-heated, hard working horse before being cooled down properly. Laminitis becomes chronic when lameness and pain continue for more than two days. Chronic laminitis can cause permanent damage to the foot when the coffin bone becomes detached from the hoof wall and rotates so that it drops down. In severe case it can penetrate the sole of the foot. Other complications of laminitis include white line disease, thrush, separations of the hoof at the coronary band or sole, and complete loss of the hoof. Acute laminitis is a medical emergency and a veterinarian should be called immediately to prevent the possibility of permanent lameness and disability. Azoturia or tying-up syndrome are degrees of a condition known as exertional myopathy which occurs when horses that have a heavy workload have a break from activity, but continue to consume a high-carbohydrate diet. When an accumulation of glycogen builds up in the muscle as a result of lack of activity, lactic acid is released and damages skeletal muscle causing it to release muscle enzymes and myoglobin. When the myoglobin is excreted in the urine, it blocks the nephrons, causing kidney failure. The resultant lack of kidney function causes the horse to become anxious, sweat profusely and develop a rapid pulse. The major muscles then stiffen causing the horse to stagger and wobble and eventually to collapse. Upon the first indication of azoturia or tying-up, all activity should stop and the horse should be given absolute rest with no physical movement at all--not even returning to the stall. The horse should be spoken to calmly and covered with a blanket. A veterinarian should be called to provide medical relief to prevent further kidney damage and aid recovery. A poor diet, especially during the developmental stages of a younger horse, can lead to conditions that make joint and bone injuries more likely. Nutritional imbalances, especially in growing horses can lead to lameness caused by developmental orthopedic diseases which include a group of related conditions such as osteochondrosis, osteochondritis, dissecans, physeal dysplasia, and wobbler syndrome among others. In each case, a breakdown occurs in the mechanism by which cartilage is converted to bone. The resultant abnormal cartilage is prone to fracture, fissure and break into small fragments that can enter the joint causing lameness. Although some horses appear to have a genetic predisposition for developing DOD, external factors include a too-high energy diet accompanied by insufficient calcium or phosphorus in the diet resulting in inadequate mineralization of bone. Also, a deficiency of microminerals such as copper and zinc, can result in defective cartilage formation. Feeding a grass hay and grain mix inadequate in calcium, phosphorus, and protein. Limb deformities are usually present at birth, although some limb deformities are the result of injury, especially to the joints during the first weeks of life. Congenital limb deformities are caused by abnormal limb positions in the uterus, nutritional imbalances in the mare, neonatal hypothyroidism or unequal growth between two sides of a long bone. Many normal foals have some degree of limb crookedness that straightens out by the time they become yearlings. Others need veterinarian treatment to correct the problem. Angular limb deformities include knock-knees, bow-legs, bucked or sprung knees, calf knees, benched or popped knees. Early recognition and treatment are important to prevent permanent damage. Treatment is usually based on x-rays and physical examination. Sometimes stall rest and therapeutic exercise are enough to correct the problem. Other cases may require splints, casts, braces or surgery. Treatment before three months of age works best in the prevention of future problems. Flexural limb deformities tend to affect young horses from birth to 18 months of age. They occur most often in the fetlock joint, coffin joint and knee joint and involves a shortening of either the deep, the superficial, or both digital flexor tendons. The cause is unknown, but one theory is that rapid growth of long bones is not matched by the growth of the tendons, causing the joint to be pulled into flexion. Trauma or a developmental orthopedic disease such as osteochondrosis have also been implicated in flexural limb deformities, and in most cases evidence is found that nutritional excesses and imbalances are also involved. Surprisingly, many young horses with diet or genetically caused orthopedic conditions can, with proper veterinary care, recover and become healthy and productive horses. 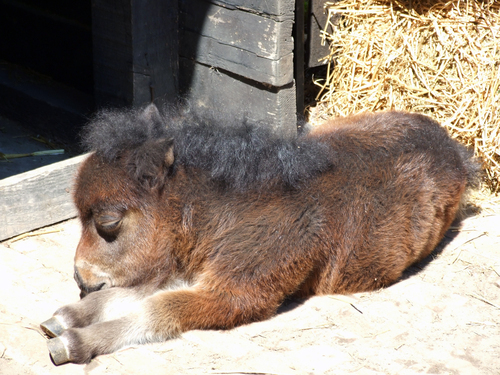 In young foals, simply walking or exercising the foal several times a day will help stretch the tendon. Energy intake should be reduced and the ration carefully balanced. Trimming the heel helps to stretch and lengthen the tendon also. When the deformity is severe or progressing in spite of treatment, surgery is advised to divide the inferior check ligament thereby allowing the flexor tendon to lengthen. In some cases ligaments may be cut in advanced cases. In all cases, a veterinarian should be involved in diagnosing and treating the problem. Determining the cause of lameness can be tricky because of the complexity of the horse's limbs and feet and the multitude of diseases, deformities, injuries, and conformation issues that can affect the way a horse moves.